Weighing a mere 0.8 lb, the Benro S2 Video Head is a compact video head capable of supporting cameras weighing up to 5.5 lb. It has 360° panning rotation for smooth camera moves. There are separate pan and tilt lock levers for locked-off shots. The sliding quick release (QR) plate on the S2 moves forward and backward to balance the camera. To prevent the camera from accidentally falling, the S2 comes with a safety lock for the QR plate which must be manually depressed for release. The integrated bubble level aids in setting up level horizons. The adjustable pan bar can be mounted to either side of the head using the built-in mounting rosettes. The S2 can be mounted to ball adapters, tripods, and other camera supports via the 3/8"-16 threaded female receiver on the 60mm magnesium alloy flat base. Add stability to your monopod with the Benro 3-Leg Locking Base. It attaches to any monopod with a 3/8"-16 female thread on its foot. The base allows for smooth pan and tilt movements due to a ball joint that can be locked with a wingnut-style locking knob. Box Dimensions (LxWxH) 13.7 x 5.45 x 4.95"
Box Dimensions (LxWxH) 6.0 x 3.5 x 3.0"
A38FDS2 Series 3 Aluminum Monopod with 3-Leg Locking Base and S2 Video Head is rated 4.4 out of 5 by 37. Rated 4 out of 5 by Big Chief Keif from Perfect for our traveling! Works perfect. So far the Monopod is awesome, it was a tad bit tight to use in the beginning. But after a few hours of use, it loosened up and i was able to maneuver with ease. The bag is a plus as it feels durable and the strap is perfect for our travels. The only issue i have is with the mounting screw and video pan handle. It is very close to the base of the camera, i had to adjust it accordingly. At first I did not notice that the camera was blocking the handle from tightening, i kept screwing it tight until i noticed it was the camera blocking it. Took me a few times to finally position it just right. That might be my fault as well. Rated 3 out of 5 by CJ from Lightweight and well made This monopod is a great value for the price. It gets the job done and the fluid video head is great. However, it's very difficult to keep the base locked and stable. And the quick release isn't at all quick. You have to screw and unscrew it each time you remove it. Rated 5 out of 5 by Powell from Surprise - The product comes and it is better than expected Primary use is shooting photos (telephoto) and videos of graduation where you are sitting and don't want to disturb people behind you, and you also need stabilization. The product is so well designed and built, that I am finding new applications almost daily. The carrying case is useful and a very nice touch. The only objection I could find is not with the product, but how to use two of the accessories that are included. Rated 4 out of 5 by the video guy from Awesome product... Just used this product for a wedding instead of my heavier pro tripod. It work AWESOME! Better than I thought it would. Light weight, portable and convenient. Rated 5 out of 5 by Jonathan from Great monopod Not quite as smooth as its manfrotto big brother, but for the price it's a great deal. Comes with a great case too. Rated 4 out of 5 by Edmund from Lightweight, sturdy & great I'm not exactly why anybody would spend $$$ on other monopods when this one is just as good (if not better) and costs much less. 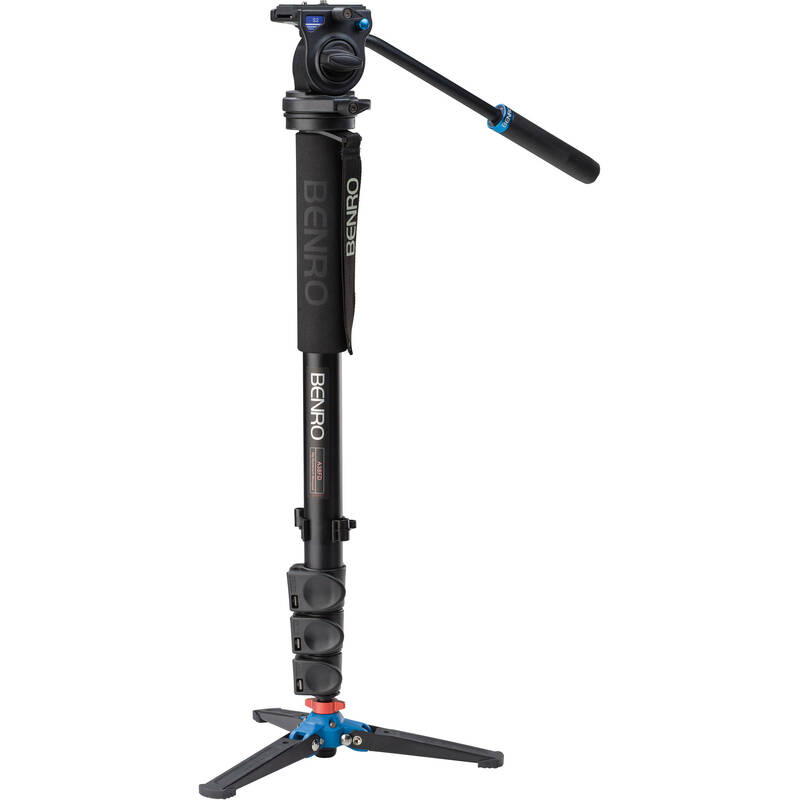 This monopod is very sturdy, has a lock on the bottom plate so you can have it stand upright without much fear of it falling over, has a smooth pan head and extends to about 6'. The only complaint is that the tilt friction/lock is located on the head itself and is not incorporated into the handle. Having to use two hands for that function is a bit tedious but for the money you save you can adjust.